When designing a commercial structure, there is one safety component that must be designed right into the building from the start: egress. 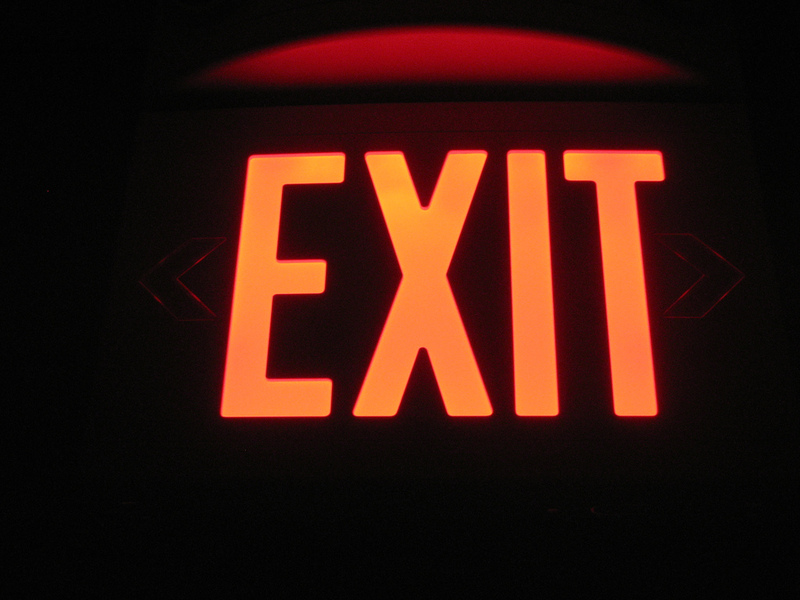 “Egress” refers to an entire exit system from a building: stairs, corridors, and evacuation routes outside the building. Each state’s building code specifies a certain number of means of egress, depending on the size and purpose of the structure. Simply put, there have to be enough doors, corridors, and stairs for every occupant to exit in an orderly manner in the event of an emergency. Historically, the biggest threat to architecture has been fire, and architecture has evolved to resist it. In the 1700s, the best that building occupants could do in the event of a fire was to shout for firemen, who would bring the “fire escape”—essentially a cart with a ladder on it. Fire escape methods became incorporated into architecture with the invention of the scuttle. The scuttle looked like a modern skylight with an attached ladder, allowing one to access the roof, at which point that person could walk onto a neighbor’s roof and climb down through their scuttle. Many cities required that scuttles be incorporated in new construction, and it was the first time that architecture was regulated for the sake of fire safety. By about 1860, New York began to require means of egress in tenement buildings. 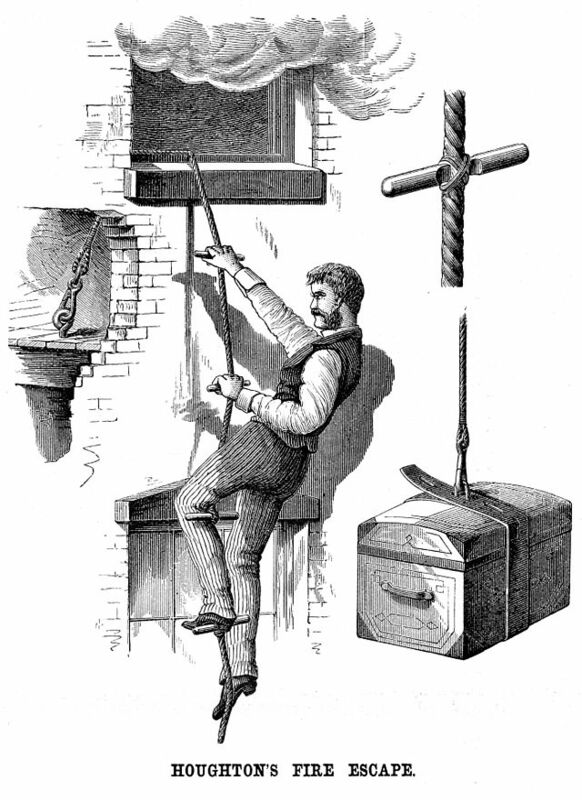 Landlords, of course, often went with the least expensive egress option: rope. There were ropes and ropes with baskets, with which people were supposed to lower themselves to the ground. There were even advertisements for fake cabinets, hollow refrigerators, and empty washing machines in which to stow away a rope baskets. One engineer actually thought that, instead of dispatching the ropes from indoors, archers could shoot the ropes up to the higher floors. 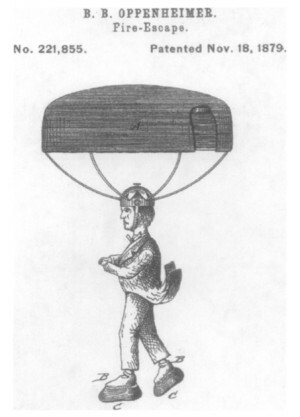 Another patent proposed individual parachute hats, with accompanying rubber shoes to break the fall. There were also fire escape slides, which were marketed to schools as both emergency devices and playground equipment. 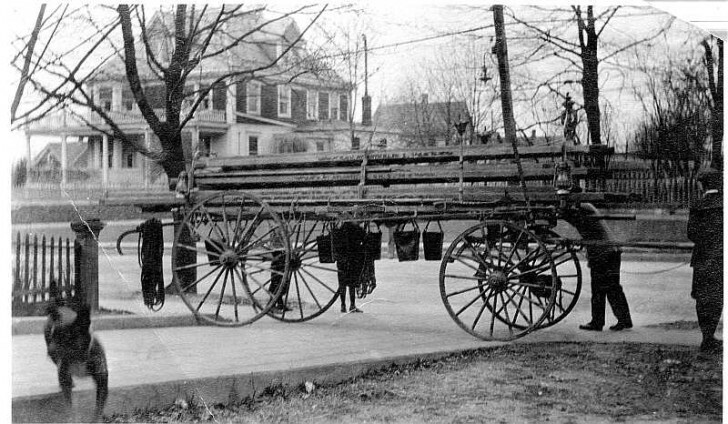 By the 1870s, fire escapes had become permanent iron structures. Some were just straight ladders clamped to walls, others were the angled ladders more resembling stairs. But in true disasters, fire escapes didn’t suffice. 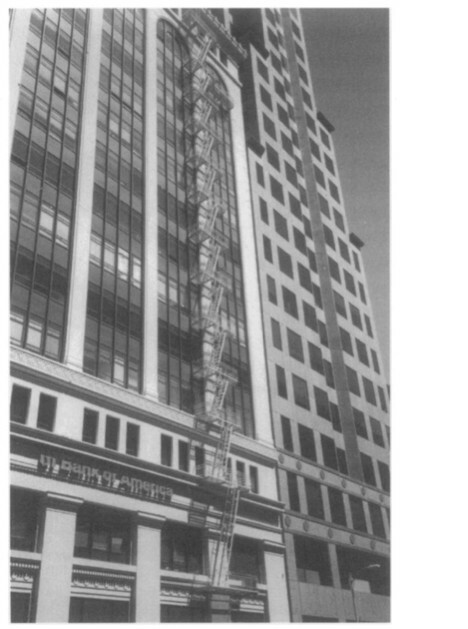 New York’s Asch Building was required to have three means of egress. The developer insisted the property would be just be used as warehousing, so rather than installing three stairs, he was allowed to put in two stairs and a thin fire escape. 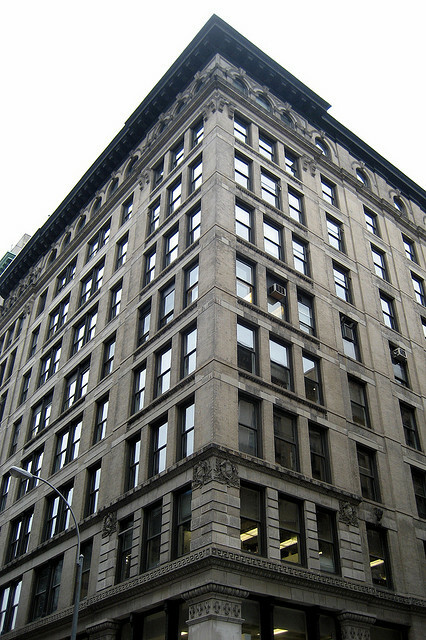 The owner rented the top three floors of the Asch Building to the Triangle Shirtwaist Company. 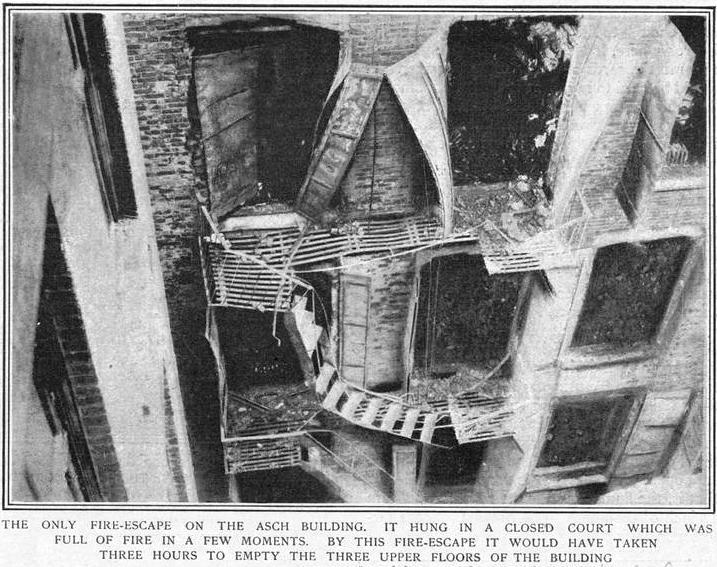 On March 25, 1911, a fire broke out in the Asch Building and spread quickly. Workers on the tenth floor were able to survive by taking the stairs up through a fire exit to the roof. 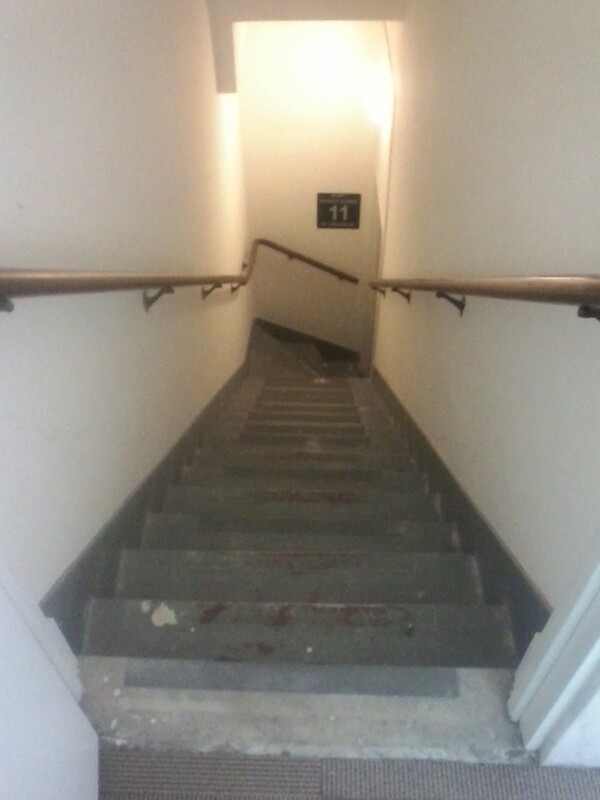 Workers on the eighth floor were by and large able to get out by taking the stairs down. But workers on the ninth floor were trapped. Only a few people on the ninth floor knew about the tenth floor exit, and most didn’t know to go upstairs. Allegedly, one of the doors out of the building was locked—though even if it wasn’t, the staircases that would have provided egress were too narrow and winding to hold the number of people who needed to escape. A number of workers tried to use the outside fire escape, but it collapsed under their weight. It was from the windows of the ninth floor that many workers, desperate to escape the flames and smoke, fell or jumped to their deaths. 146 people died, most of them women, right in the middle of Greenwich Village. The building, however, was fine. It was a fireproof structure, which is why, at the time, no one really thought it needed egress. The Asch building, now called the Brown Building, is part of New York University. The Brown Building of Science. Credit: Wally Gobetz. 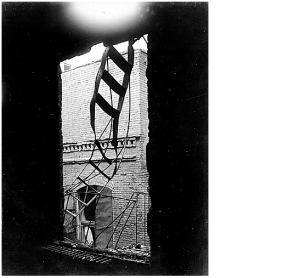 Exits and egress were a problem, people thought, for the tenements and poor quality buildings. Popular logic was that if a building was first class and non-combustable, the occupants could be safely locked inside. The Triangle fire proved that architecture couldn’t protect people. People had to protect themselves from architecture. After the Triangle Fire, the National Fire Protection Association started collecting data and studying effective egress. Fire escapes, it turns out, just didn’t work. Because they weren’t commonly used, fire escapes were often in states of disrepair or eroded by the elements. 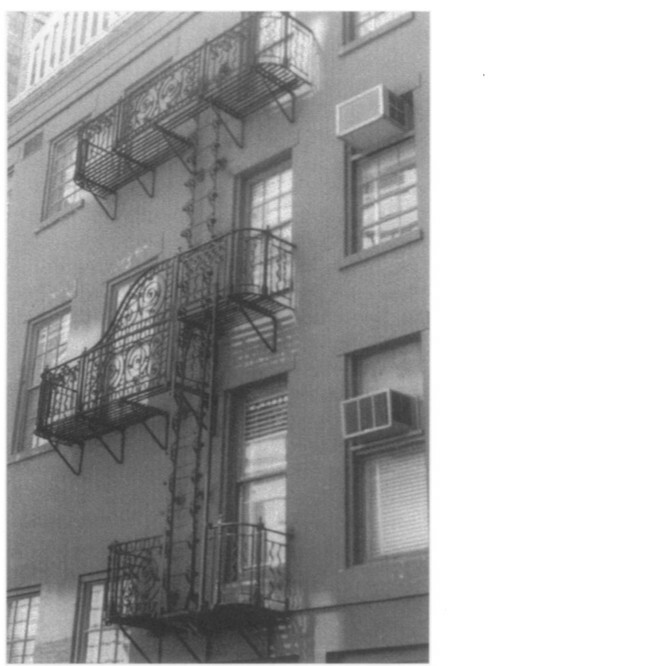 Even if they were maintained, fire escapes were not accessible to people with disabilities, the young, the elderly, and women, who were hamstrung by their long skirts. Most importantly, since people were not accustomed to using fire escapes, they often didn’t know where they were located. 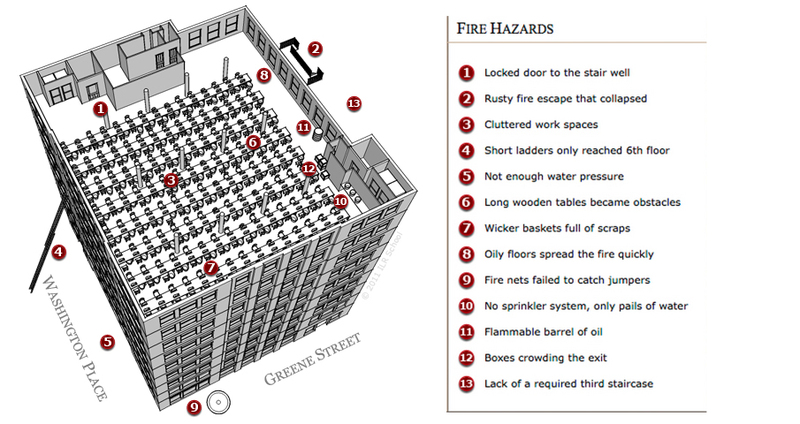 Generally speaking, people try to leave a building the same way they entered it, and the modern fire escape is designed for this logic. They are the first place you would think to go in an emergency. They are the stairs. Or rather, they look like normal staircases, but they are truly pieces of emergency equipment: enclosed in fire proof walls, sealed with a self-closing door, and covered in sprinklers and alarms. The fire stairs in Oakland’s Tribune Tower. Credit: Alex Kelley. 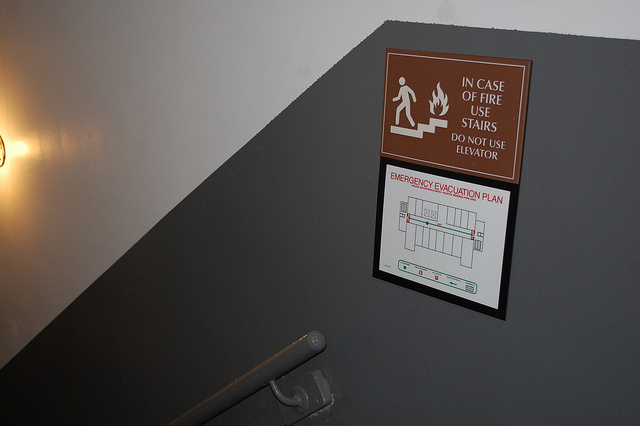 Because the fire stairs work perfectly well as stairways, they’re often the stairway in a building. Rather than spending the money and space on an opulent lobby with a grand, sweeping stairway, new construction tends to just have elevators and fire stairs. Today, fire stairways need to be “rated,” meaning they need to be enclosed in a construction that won’t melt or allow the fire to penetrate as quickly as a non-rated wall. This is why the stairs are always shoved off into a cold, industrial-looking tower, no matter what the building looks like from the outside. The rated towers and other emergency structures are now modeled with egress software such as Exodus, which allows architects and consultants to plug in the measurements of the building, its emergency equipment, the maximum number of occupants, click “play,” and watch digital people escape the pixel flames. 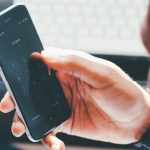 This software works because humans generally behave predictably in emergencies. In a state of panic, people don’t want to go places they haven’t gone before, or use devices they’ve never seen, or suddenly see if they can catch a rope shot with a bow and arrow. The way egress works now is in keeping with the way we use buildings normally. Rated towers might be ugly, expensive, and space-consuming, but they help save lives. In 2012, there were 65 deaths in non-residential structures, which are the buildings with the heavy regulations and rated stairways. This number is already down from 2003, where there were 220 deaths in non-residential structures. This is the accordion fire escape outside our window. Eek! BUT WAIT! THERE’S MORE: we want to see your “Good Egress” inspired images for our Now You See It project. Submit to our Flickr group, email them to [email protected] or put them on Instagram with the hashtag #99PI. 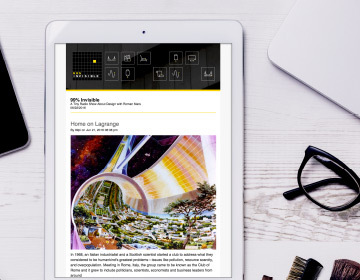 We’ll be curating and presenting our favorites on our Instagram and Tumblr. Need inspiration? Check out Kate Joyce’s latest Image Correspondence posts. 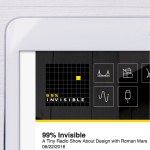 As mentioned in the credits, Roman will do a Q&A and perform 99pi stories live at the Sounds Alive Audio Festival in Dublin, Ireland on Sept. 6, 2014. Come out and see some radio! *Correction: We incorrectly referred to One World Trade Center as “Freedom Tower.” The name was changed in 2009. 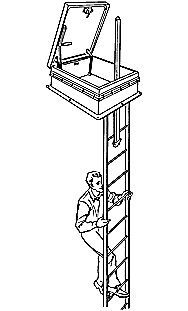 Can you link to or post a picture of an accordion ladder fire escape? 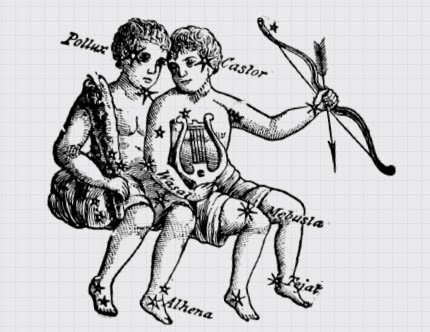 When Google Imaged two main types come up, 1. those that are permanent on the side of a build and are Z shaped (as see countless movies) and 2. those that are temporary and kind linear with an repeating X pattern. It would be interesting if it was the first one because you’ll always now that those films were shot in the bay area. I never realized the Triangle Shirtwaist Factory building was still around. That alone is somewhat shocking — it should have been torn down. Funny, I’ve only the last few months been obsessed with finding the tallest (biggest drop to ground level) and highest (above sea level) fire stairs in downtown SF. Now that I heard the bit about accordion stairs I’m seeing them everywhere. Thank you for another delightful podcast. As a suburban child of the 80s, my introduction was, I suspect, hardly unique among your listeners: Sesame Street and Bugs Bunny. 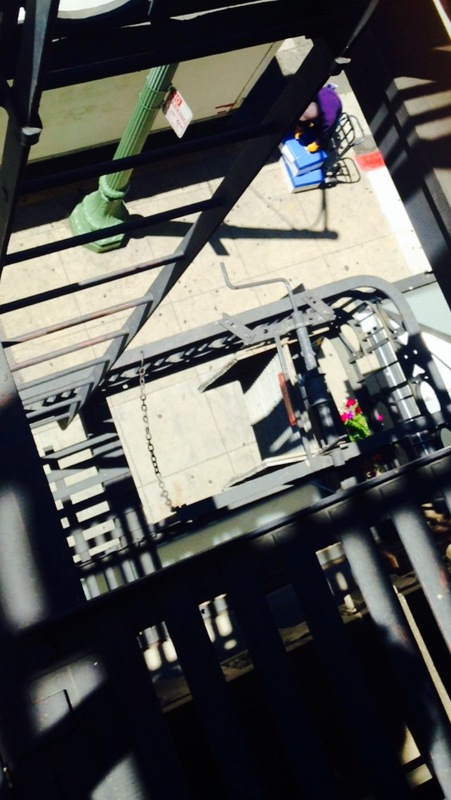 They were, of course, the Z-shaped stairs with the last flight hovering above the sidewalk. When I moved to San Francisco as an adult I immediately noticed the accordion escapes being different, but I never realized how unique they are. Any thoughts as to why they’re in the Bay Area and nowhere else, or why they seem to be the only variation in fire escapes? Writing from the 17th floor of the federal building at 450 Golden Gate in San Francisco. 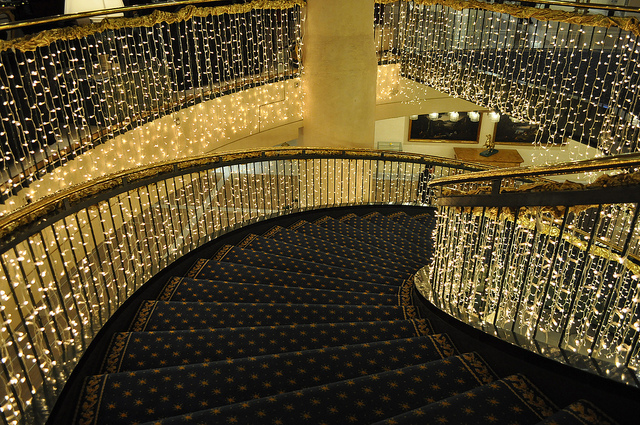 We have several big, wide, well-lit, clean, sturdy staircases. Last year I worked in the public defender’s office down on Bryant, and…well, I’m glad it was only three stories so you could jump from a window if you really had to. Clearly there’s a direct relationship between budget and safety. I would send pics of our primo staircases, but I’m pretty sure that if I walk around taking photos of the various ways in and out I will end up spending my weekend answering a lot of questions in the homeland security office. Keep up the awesome work! Roman, are you still doing office hours? Japan actually still has slides for fire escape in schools. 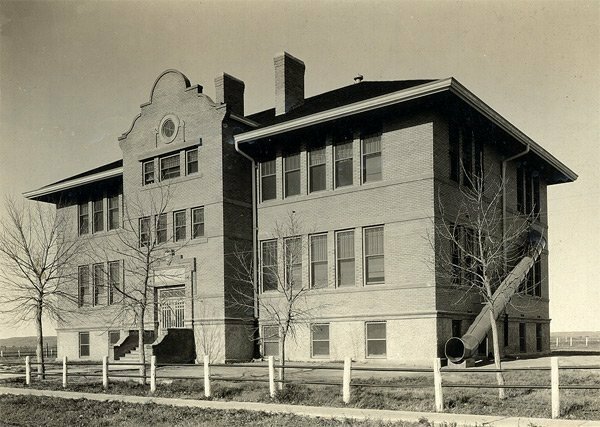 I can’t find the source anymore, but if I recall correctly any school with more than two floors here must have slides for fire escapes. And yea, they double as plain old fun slides during breaks. Thank you for a great podcast – as always. It made me think of a recent encounter I had with a unique egress at the New School’s University Center. SOM incorporated the egress under the grand stairs that wrap the building. It was cool to see this mandatory element in a new light. 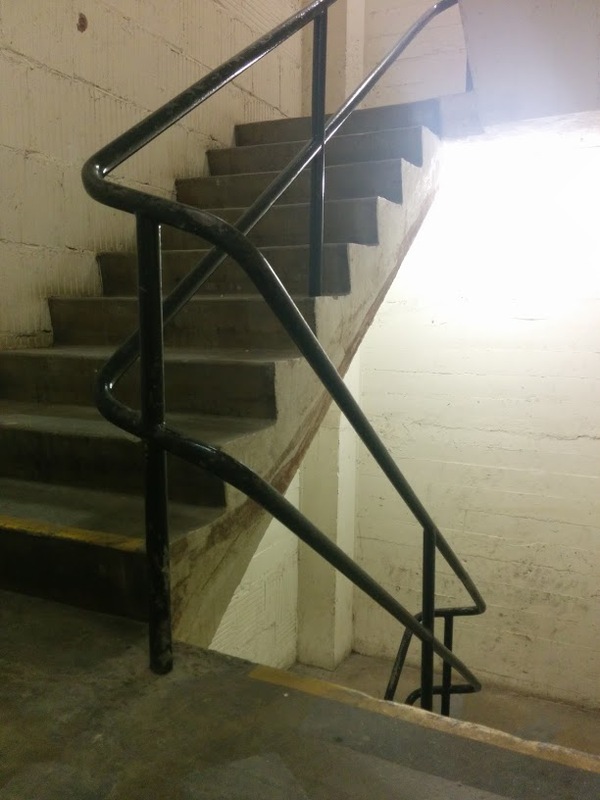 “The way egress works now is in keeping with the way we use buildings normally.” Um… except that the onerous regulations that remove staircases from general use also mean no one knows where they are. In many cases, they are prohibited except in emergencies. I worked in one of the tallest buildings in San Francisco, and the FD came by to make sure we all knew how to evacuate. They did a quiz, and I was one of maybe 10% of the people on the floor who knew where the fire stairs were. And they weren’t even hidden! Right there, with a lit sign, next to the bathroom and supply closet where everyone stares at it all day. Almost all the escapes from above the impact zone were people who explored a bit (or followed others doing the same) and found another staircase they had never been aware of. Similar events are from other serious disasters, like cruise ship fires or capsizing, where emergency exits are not familiar so cannot be easily recalled or used during the emergency. Lest you think I disagree with fireproof stair towers, I just want there to also be regulations requiring they be open (unlocked) for general building traffic, and something to encourage/require they be readily discoverable, and easy to access. 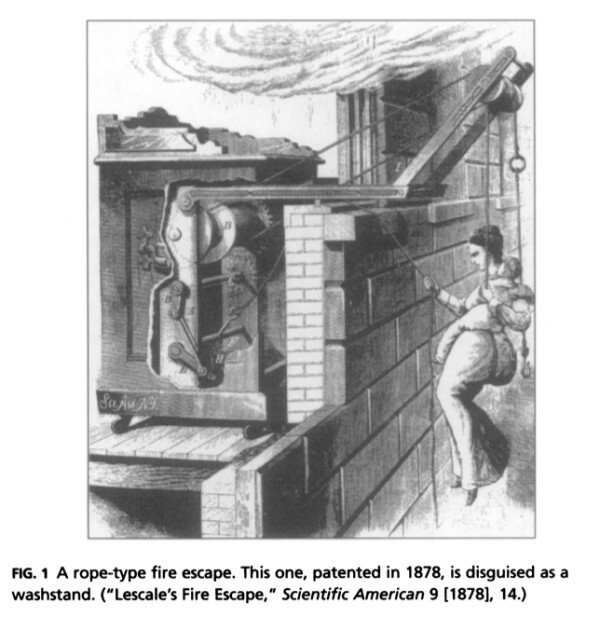 There is a very imaginitive story titled “The Golden Age of Fire Escapes” It’s episodes 142 and 143 on Drabblecast.org. Dawn of Midi? Beautiful find.